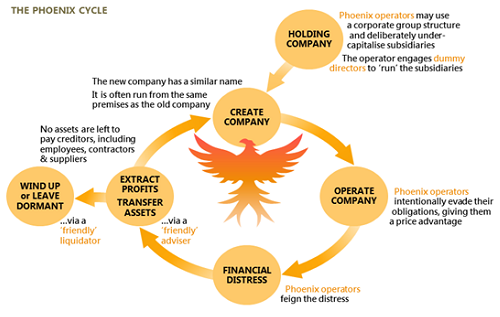 Illegal phoenix activity involves creating a new company to continue the business of an existing company that is deliberately liquidated to avoid paying taxes, creditors and employee entitlements. Directors involved in this activity transfer the assets of the existing company to the new company without paying fair or market value, leaving any debt with the existing company. After transferring the assets, the director usually places the existing company in liquidation, leaving no assets to pay creditors. The new company continues the business. It is often managed by the same directors and operates in the same industry. By engaging in this illegal practice, directors intentionally avoid paying debts owed to creditors, employees and statutory bodies (e.g. the Australian Taxation Office). Illegal phoenix activity can involve serious criminality, including breaches of director's duties or fraudulent concealment/removal of assets under the Corporations Act 2001. Penalties include large fines and imprisonment for company officers (directors and secretaries). The key difference between a legitimate business rescue and illegal phoenix activity is the director's intentions to avoid paying debts and liabilities. parties involved in managing the old company control the new company – either as the directors or 'controlling minds'. The law holds each of the key players equally responsible and may be subjected to the same penalties if it is proved that they aided, abetted, counselled or procured a director to engage in illegal phoenix activity. Illegal phoenix activity has far reaching implications, impacting the business community, employees and contractors and the government. Where tax avoidance occurs and government revenue is lost, illegal phoenix activity impacts the entire community. Three Phoenix Taskforce member agencies (the ATO, ASIC and the Fair Work Ombudsman) commissioned PricewaterhouseCoopers (PwC) to measure the impacts of illegal phoenix activity. The 2018 report – The Economic Impacts of Potential Illegal Phoenix Activity – estimates the economic impact of illegal phoenix activity on business, employees and government. ASIC and other government agencies work together to deter, disrupt and detect directors and others who engage in illegal phoenix activity. ASIC uses a number of regulatory strategies to disrupt it, including proactive surveillance on companies, directors and professional facilitators; implementing compliance programs and taking administrative, civil and criminal enforcement action. These strategies aim to deter directors and facilitators from engaging in illegal phoenix activity, hold them accountable if found to have breached the law and protect creditors, employees, consumers and government revenue. Read our 2017-18 business plan for more information about our work to combat illegal phoenix activity. Key government agencies, including ASIC, work together through the Phoenix Taskforce and Serious Financial Crime Taskforce to reduce and deter illegal phoenix activity. The Phoenix Taskforce uses data matching tools to identify, manage and monitor suspected illegal phoenix activity. disrupting the activities of, and taking action against, untrustworthy advisers who assist directors engage in illegal phoenix activity. Company director convicted after instructing debtors to redirect the payments owed to the company to his personal sole trader bank account. Read the media release. Company director convicted for failing to produce books about its affairs to ASIC. Read the media release. Queensland company director charged with thirteen counts of breaching director duties. Read the media release. ASIC disqualifies former director from managing companies for maximum period for engaging in illegal phoenix activity. Read the media release. Transport company convicted for failing to produce books to ASIC. Read the media release. Two former company directors have been convicted and sentenced after pleading guilty to ASIC charges concerning a breach of director’s duties and the fraudulent removal of company assets. Read the media release. A former director has been convicted for failing to assist ASIC in an investigation. Read the media release. A former director has been convicted of dishonestly using his position to fraudulently remove company property. Read the media release. A company director engaged in phoenix activity by transferring the business of an indebted company to a new company, leaving the initial company with no assets to pay creditors while continuing what was essentially the same business using the new company. ASIC disqualified him from managing companies for the maximum period of five years. Read the media release. ASIC also banned a company director for the maximum five years after illegal phoenix activity left his five failed companies with debts of approximately $3.5 million. Read the media release. A company director used tax debts collected on labour hire costs to continue trading companies instead of remitting the debt to the Australian Taxation Office. ASIC banned him from managing corporations for three and a half years. Read the media release. A director of a distribution business was found to have engaged in illegal phoenix activity after he transferred the assets of an indebted company to a new company, leaving insufficient assets to pay creditors. ASIC banned him from managing corporations for four years. Read the media release. A franchisee was convicted of fraudulent activity after she transferred plant and equipment and reassigned leases from one company to another, which meant that creditors may have been denied access to the company's assets. ASIC banned her from managing corporations for five years. Read the media release. A Queensland franchisee has pleaded guilty to dishonestly using her position as a director of a company. Read the media release. A former director has been convicted and sentenced after pleading guilty to dishonestly using his position as a director of a company. Read the media release. Director of plumbing business convicted of fraud was sentenced to a Community Correction Order for a period of 3 years after previously pleading guilty. Read the media release. Former director has pleaded guilty to dishonestly using her position as a director to fraudulently remove company property. Read the media release. ASIC disqualifies Queensland father and son from managing companies. As a result of information contained in reports lodged by the liquidators of the failed companies, ASIC was concerned that both men had failed to discharge their director duties. Read the media release. A turnaround business adviser aided a director to dishonestly use their position as a company director to conceal the actual ownership of company assets from the liquidator appointed to their company. Read the media release. ASIC accepted an enforceable undertaking from a liquidator after they failed to adequately investigate potential illegal phoenix activity. Read the media release. ASIC had concerns about two liquidators who allegedly failed to report to ASIC suspected shadow directors and offences underlying suspected illegal phoenix activity. Read the media release. Sample Homes Pty Ltd is a company operating in the building and construction industry. Like many businesses, Sample Homes uses other companies or contractors to complete its projects. Read more. We also work with Government on potential law reform measures to deal with illegal phoenix activity, including those proposed in 2017. Various entities affected by the illegal phoenix activity lodge reports of misconduct with ASIC. These include trade creditors, employees, liquidators and government agencies, including the ATO and FWO. We rely on liquidators' statutory reporting to ASIC about illegal phoenix activity. If you are concerned about such conduct, the best course of action is to contact the liquidator where one has been appointed: see Report 558 Insolvency statistics: External administrators reports (July 2016 to June 2017). While ASIC does not take action in every instance of alleged misconduct, we do take action where it will likely result in greater market impact and benefit the public more broadly (see Information Sheet 151 ASIC's approach to enforcement for full details of what we consider in deciding whether to take action). The Government is committed to preventing phoenix abuse and assisting victims. There are a number of ways to get help. If you worked for a company now in liquidation, ASIC can provide advice on whether you are an unsecured creditor of the company and wish to make a claim against your employer. The ATO can assist you with chasing lost or unpaid super. We can also provide advice on what to do if you have been a victim of phoenix or you can report suspected phoenix companies to us. The Fair Work Ombudsman can assist you with advice about minimum wages and conditions of employment.